In the words of Darden school of management professor and Conscious Capitalism, Inc trustee Ed Freeman, “We need red blood cells to live (the same way a business needs profits to live), but the purpose of life is more than to make red blood cells (the same way the purpose of business is more than simply to generate profits).” While making money is essential for the vitality and sustainability of a business, it is not the only or even the most important reason a business exists. Conscious businesses focus on their purpose beyond profit. What better way to achieve executive enlightenment than through meditation? For the ultimate in corporate consciousness, follow me to the next logical step. Who wants meditation? Google wants meditation. 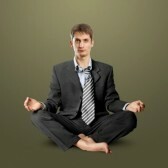 Twitter and Facebook offer in-office meditation sessions and encourage work routines that maximize mindfulness. But, let's face it: Google, Twitter and Facebook are the cool kids. Imagine a world where the dorks of the corporate world like accounting firms and widget manufacturing plants, bring a teacher in to teach employees to meditate and provide a dedicated private space where someone can sit in stillness. Instead of coffee breaks (not sure such a thing still exists), there would be meditative moments. There is a productivity paradox. Find the time to sit and do nothing and you will have more time available and accomplish more. Meditation grows empathy and connects organic concepts in its subtle quiet way. Even the mystical aspects of meditation tread softly. The practice is inscrutable, but the results are evident. Who says it won't help the bottom line?